This iteration of Mini-Reviews marks a new step in Can This Even Be Called Music‘s. Since our inception, we’ve been growing further and further from review scores because of the many problems inherent to them. The previous step was the shrinking from percentage scores to a simplified, three-level system, but it still retained many of the problems that any scoring system has. Namely, they oversimplify an often complex and subtle appreciation of a piece of art, they cannot represent integrally the complete written review, they can be misleading, and people might only look at the score without even reading a word of the review. Moreover, it represents an additional stress for the reviewer, as the score must be representative of the review, and vice-versa, meaning that we would often change the score or the review before publishing it, which is a problem in itself. Starting today, all reviews on the website will be without any form of scoring system. The review should stand on its own, and will note all positives and negatives of the reviewed piece, subjectively. And a tip for the lazy reader: the conclusion is basically the review in a nutshell. Hopefully, you’ll be as relieved as us for this change! So, without further ado, let’s dive into our twenty-ninth set of mini-reviews! Silo is a very sweet math rock project incorporating a few progressive, alternative, and ambient elements to its formula. The piano and guitar leading the music interchangeably are fresh and soothing for most of the time. There’s even some more exotic instruments, like a xylophone in ‘The Llama’. Some songs are completed with singing, but it doesn’t cast a shadow on the rest of the music, as it’s rather quiet and a bit in the background. In the end, Noah’s Lark is perfect if you’re seeking chiller vibes. British progressive, jazzy electronic math rock band Strobes just released Brokespeak, their debut album. Subtle polyrhythms are the main driving force behind this quietly complex showcase of musicianship and writing skills. Without being flashy, the tracks are layered and intricate, and can therefore be enjoyed on multiple degrees. Each song stands on its own while bringing something new to the album as a whole, which makes it a really outstanding and fun one to listen! Germans Ånd just released Aeternus, their debut EP. 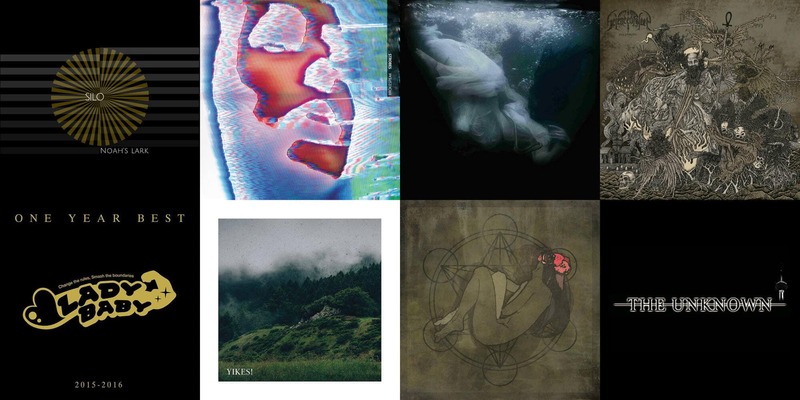 At twenty-six minutes long, it manages to bring us seven short post-black metal tunes that are very enjoyable, even if they miss some of the characteristic traits of post music: length, ostinati, and crescendi. Nevertheless, the result is a caustic new salve of potent post-black metal. Coming on November twenty-fifth, Science of Sleep‘s latest release: Hellmouth. Their brand of death metal, bordering on deathcore, just plows through with constant crushing riffs and destroyer drums. This does make the album a bit stale, around halfway through the forty-three minute running time, but each song, on its own, has the same quality and power as the previous one. It’s just cripplingly lacking in variety. Japanese idol metal act Ladybaby recently released One Year Best ～2015-2016～, a compilation album including their three official singles, as well as one new song and an introduction track. The ‘selling point’ of this idol band is definitely their massive singer, Ladybeard, who is an Australian wrestler and singer. They bring new heaviness to the same sort of J-metal also played by Babymetal, thanks to Ladybeard’s harsh vocals. The songs are unsurprisingly very uplifting and energetic, and not really complex, but enjoyable through and through. If you’re not into that kind of music, it’s totally fine, but if you’re ashamed of admitting you like it, you should reconsider your priorities. Ladybeard’s recent departure from the band ushered in a change of name. From then, the band is called かつてLADYBABYと呼ばれたアイドル (The Idol Formerly Known as Ladybaby), and will go on with Rie and Rei on their own. I don’t know what to expect from the change, but I guess it will only sound more like Babymetal. They’re releasing a new single by the end of the month. Yikes! is an American indie math rock band. Their self-titled EP consists of only two short tracks, but they are utterly loveable. ‘Summer of Beer’ and ‘Thanks, Jeff’ are two chill tracks perfect for your laid-back moods. Seriously, these are just unbelievably good! Yet another math rock band in today’s set: Naga. Sophia is their debut EP, and it came out in July of this year. Their compositions also bring in some progressive rock and post-rock elements to the math rock substructure, so that their very own stylistic blend is unique. All five tracks have their own personality as well, which makes for a quite varied experience. Iranian post-metal project, The Unknown, just released a new as of yet unreleased track, Meanwhile in Our World, with an accompanying music video. Taking a drastically different approach than their forty-minute, one-track album, In Search of the Unknown, which was a much more atmospheric piece. ‘Meanwhile in Our World’ is only four minutes long, but we get straight into the action with progressive metal riffs in a post-metal song structure. It’s a very good song, even though the vocals are yet again the weakest point of it. My all-bass project, vod, just released Mūsica incognita, where I totally reject the most basic assumptions about tempo, timing, and tonality. The fretless instrument allowed me to play with complete disregard of conventional scales (even microtonal ones), while the studio environment made it possibly to play out of time and making all the instruments play together regardless. This twelve-minute song was originally two tracks of a much more ambitious project, but the sheer difficulty of crafting such music proved to be too much for me, so I instead decided to release what was done as a single track. Hope you enjoy it! On	November 4 2016, this entry was posted.